While gift giving is a very kind way of showing love, care and gratitude, people adopted a busy lifestyle often tends to forget special occasions for their beloved ones. Kaado, a social mobile application developed by Beijing Joyful Technology, aims to tackle this problem by allowing users to choose and send impromptu gift cards to friends and family members. The app will send alerts to users when birthdays or anniversaries of friends are approaching after they are connected with friends from different channels, such as, phone contacts, QQ, Weibo, and Renren. With special focus on social functions, Kaado allows users to share gift cards to other social communities. This function enables the platform to transform the social footprint to personalize recommendation engine, because the trending products in the market are handpicked by real people to share. The app integrates various gift cards with photos, prices and detailed introductions. 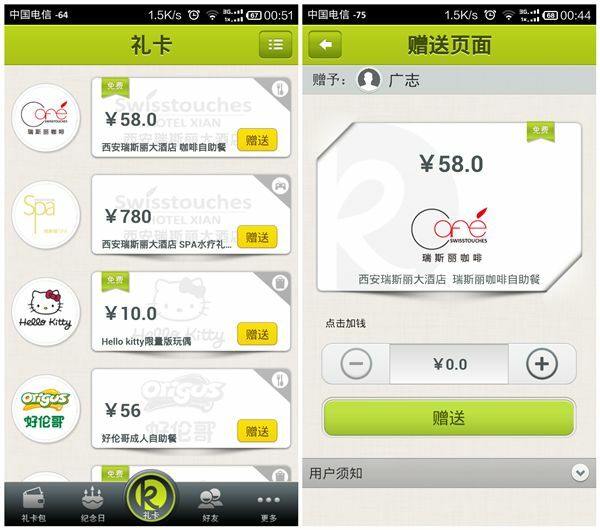 Users can pay for them via UnionPay or AliPay and then send them to friends directly. The app is available on both iOS and Android platforms. Similar apps are Eliquan and Wowgift.